With gas prices always on the rise it seems more and more people will be looking for alternatives means of transportation. However, a bicycle isn’t always the best way to go. You can’t get on the interstate with a bicycle and not every street is conducive to traveling this way. If you are lucky enough to live close to work you may not spend much money on gasoline, but if you commute long distances then it could become quite expensive just to drive to work. Electric cars are always great alternatives as are hybrids. But check out this article I just found on a coffee powered car. I’m game! 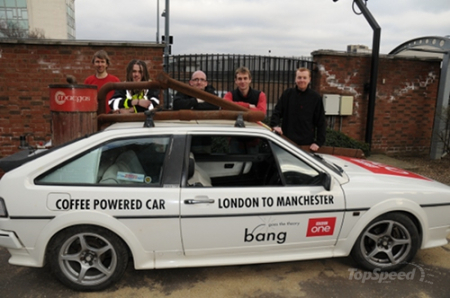 !Coffee-Powered Car Breaks Land Speed Record picture: 418548 – Top Speed. This entry was posted in Cars and tagged all star automotive, car, car buying, gas prices by All Star. Bookmark the permalink.